It really annoys me when people say that nothing in this song is ironic, because it really is. if you think that (as everyone says) that every example of irony in the song is simply just bad luck, than in that sense *all* irony is bad luck. and vice versa. "happening in the opposite way to what is expected, and typically causing wry amusement because of this" synonyms:	paradoxical, incongruous "it's ironic that a former illiterate is now a successful writer"
the only thing ironic about this song is the name lol because the song is not ironic at all..but you would think it would be! !haha love this song tho!! The things thats itonic is how not ironcic the song is, the examples she gives is bad luck or typical...Its a great song though, she has a fantastic voice. 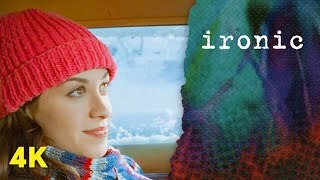 why is this song called 'ironic'. The only thing that is 'ironic' about this song is the name. Because the song is not ironic at all.